The NSF Center for Nanothread Chemistry (CNC) is a Phase 1 National Science Foundation Center for Chemical Innovation (CCI). It brings together a team of chemists from Penn State, Cornell, NYU and Brandeis universities to define the chemistry to produce a new class of organic molecules that have pervasive covalent bond connectivity in multiple dimensions. Nanothreads, the first such example, are highly extended one-dimensional molecules with cage-like bonding, akin to the thinnest possible threads of diamond and capped by circumferential hydrogen. Thus nanothreads are "hybrids" of hydrocarbon molecules and carbon nanomaterials that should collectively share the properties of both. In Phase I CCI's such as the CNC are supposed to develop collaborations and plans for a proposed Phase 2 effort in 2 years (October 2020), which is about 7 times larger per year and extends over five years, renewable to a further five years. The team shares a collection of key advances in nanothread science, as presented on the Nanothread Discovery Timeline. They were first theoretically predicted by Crespi at Penn State in 2001 and then synthesized there in 2014 by Badding with graduate student Fitzgibbons. Crespi's insights were then key to the identification of the benzene reaction products as nanothreads. Trauner independently reported theory investigation and attempts at synthesis of polytwistane nanothreads, beginning in 2014. Hoffmann and co-workers first predicted the formation of a nanothread from benzene in 2011. Schmidt-Rohr reported the first comprehensive quantitative and selective advanced NMR studies of nanothreads in 2018. These efforts have stimulated many theoretical investigations. See the Nanothread Bibliography. 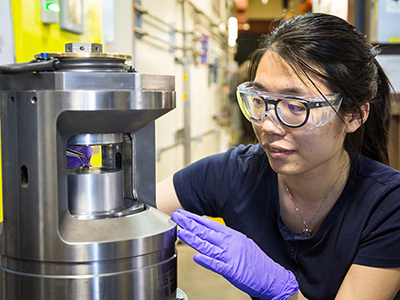 Graduate student Xiang Li with the Paris-Edinburgh opposed anvil press used to synthesize nanothreads. Synthesis and synthetic methods are at the heart of chemistry, for if a molecule, polymer, or solid cannot be synthesized, it cannot be studied experimentally. Thus synthesis is a key focus of the Center. Whereas other extended carbon structures such as nanotubes or graphene are made by high-temperature, high-energy methods, nanothreads are synthesized by an innovative mechanochemical technique in which molecules with multiple unsaturated functions react under directional stress applied at carefully controlled rates. This strategy overcomes the traditional requirement for topochemical commensuration between the reactant and product and thus allows for many more molecular crystals to react into well-defined structures, the first examples being benzene-, pyridine- and hexafluorobenzene-derived threads. They are recoverable to ambient pressure, thus far in tens of mg quantities. More than a million kg of diamond is synthesized per year (far more than is synthesized by CVD) at a pressure about two times lower than that currently used for nanothreads; reducing the nanothread synthesis pressure to this regime is thus a key center goal. The Center team will develop an actionable understanding of the reaction mechanism of nanothreads to enable the design of threads with desired arrangements of both interior heteroatoms and exterior functional groups, and use this understanding to scale up synthesis by reduction of reaction pressure. Post-synthesis modification will allow for versatile incorporation of new groups of diverse function that can then interact in well-defined ways along the thread backbone. Structures beyond one-dimension may also be possible, thus opening a new subfield of chemistry in which novel structures and properties can be explored. Nanothreads have a demonstrated resonance with the public imagination due to their unique architecture and potential for extreme strength; this provides opportunity for compelling and attractive outreach activities. Innovation is integrated deeply into all Center activities, including professional development, informal science education, outreach to under-represented groups, and potential commercialization pathways. A rotating polytwistane nanothread. Polytwistane is one of more than 50 nanothread structures that have been enumerated (Phys. Rev. Lett. 87, 125502 (2001), Nano Lett. 15, 5124 (2015)) and was first investigated by Trauner (Chemistry-a European Journal 20, 1638 (2014).). The four-fold coordinate sp³ bonding of the carbon atoms (black spheres) along with the capping hydrogens (white spheres). These hydrogens could be substituted with functional groups or even attached molecules. The best experimental evidence to date suggests that nanothreads, although ordered along their length, do not have the chemical structure of polytwistane, but rather that of a more complex nanothread such as stiff-chiral-3 (see example nanothread structures and JACS 140, 7658 (2018)). Nanothreads are sometimes informally called "diamond" nanothreads. Arthur C. Clarke discussed " a continuous pseudo-one dimensional diamond crystal" in his 1979 science fiction novel, The Fountains of Paradise. Vin Crespi says about the logo, "My take on it is that it is sort of atoms, sort of a diffraction pattern, sort of a single nanothread, sort of a bundle of nanothreads". Six-fold symmetry axes pervade nanothread science.